John Vigor's The Seaworthy Offshore Sailboat is the best book you can read when shopping for the right sailboat to take offshore or to learn how to upgrade your own sailboat for offshore sailing or extended cruising. Chapman's Piloting & Seamanship for 65 editions and almost a century has been the classic tome about virtually everything related to boats - the book many older sailors grew up trusting. Nigel Calder’s How to Read a Nautical Chart does much more than teach the basics: it provides critical information about how to interpret chart accuracy especially when using electronic charts. John Rousmaniere's Annapolis Book of Seamanship like Chapman's is thorough and almost as encyclopedic, with a bit more of a sailing focus. Robby Robinson's International Marine Book of Sailing is a great book for learning to sail - but is much more. 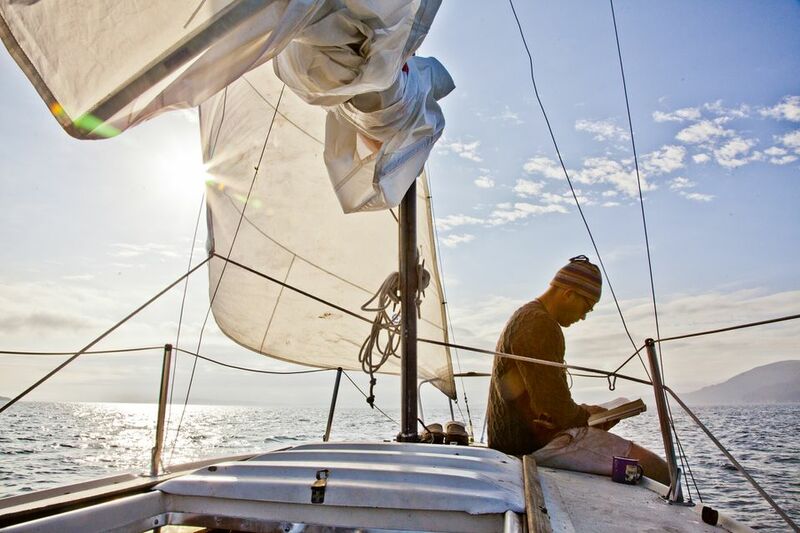 It gets you sailing right away as you then read on to learn more about seamanship, navigation, and all the basics of sailing. Wonderfully well written. Don Casey's Complete Illustrated Sailboat Maintenance Manual is the best reference book for learning how to repair, maintain, and care for your boat. Beth Leonard's The Voyager's Handbook is the must-have bible for preparing for and then going long-distance cruising under sail. Bill Seifert’s Offshore Sailing is a hugely practical compendium of practical information for any sailor heading offshore or on a longer coastal cruise. John Vigor’s The Practical Mariner's Book of Knowledge will inform you much more about boats and sailing than you could imagine. Paul Keller's Cruising for Seniors has useful information and some good reading for anyone wondering about how long-term sail cruising may or should be different once you're old enough to start thinking such thoughts. Sailing: Catching the Drift of Why We Sail is a brilliant book exploring the philosophy and meaning of sailing in all its aspects. The Sailor’s Book of Small Cruising Sailboats is a great starting point for anyone shopping for a trailerable sailboat or pocket cruiser. The U.S. Navy SEAL Survival Handbook contains a lot of useful information for offshore sailors who might find themselves in a survival situation. Miles Kendall’s Sailing Pocket Companion is a curious little sailing miscellany intended to be more fun than useful. Sailors' Secrets by Michael Badham and Robby Robinson is a compendium of almost everything you will someday need to know about sailing or dealing with boat stuff. Sailors have always told their own stories of their sailing adventures, and many hundreds have been published over the last century. The best of these not only are a good read as a story but also can teach a lot about how to enjoy sailing at its finest and to avoid mishaps at sea. Bernard Moitessier's memoir The Long Way is one of the best-ever narratives of a philosophic master sailor singlehanding around the world. Voyages of a Simple Sailor by Roger D. Taylor is a collection well-written sailing narratives in which the sailor-philosopher also teaches self-sufficiency and independence. Tania Aebi's Maiden Voyage chronicles her 30-month solo circumnavigation begun at age 18, a story of adventure and maturation at sea. Beth Leonard's Blue Horizons collects together wonderfully well-written columns she wrote during a 6-year navigation - a bright portrait of a couple's life cruising under sail. Chris Stewart's Three Ways to Capsize a Boat is a memoir about learning to sail and adventuring in the Greek Isles and across the Atlantic - a charming and very funny book. Patricia Vellinga's Sailing There tells a great story about crossing Europe by canal and then sailing all over the Med - an enjoyable sailing travelogue. Torre DeRoche's Swept: Love with a Chance of Drowning is a true tale about an inexperienced sailor cruising off into adventure with her boyfriend in a small sailboat across the South Pacific - a great read! Michael Cosgrove's Imperfect Passage is a story of crossing the Pacific in a 40-foot sailboat, visiting tropical islands, and experiencing terror at sea. It's quite an adventure as well as a personal quest. Michael Hurley's Once Upon a Gypsy Moon is a memoir less about the sailing itself than an autobiographical sketch involving an inner adventure. Matt Vance’s How to Sail a Boat explores in delightful stories and personal essays the grand and tawdry experiences of a sailing writer who is both thoughtful and humorous sailor. Michael Tougias's A Storm Too Soon is a true story of rescues after a hurricane-like storm sinks three sailboats. Bernard Cornwell's Wildtrack is among the very best sailing novels in part because it so skillfully blends its sailing dimension with traditional aspects of the thriller novel complete with love interests, subplots, and international intrigue as well as a cast of interesting characters and villains. Cornwall's Stormchildis another thriller novel involving a lot of sailing. Christine Kling's thriller Circle of Bones is a well-written, engaging, suspenseful novel set on boats and Caribbean islands. Mitch Davies' novel Better Than Ever, Again is an action adventure tale involving sailing in the South Pacific, but read this review before getting too excited. It's important to know where you're going when cruising! The Atlantic Cruising Club 's Guides to Marinas are among the better traditional print products that provide information about marinas you may visit while cruising. The ActiveCaptain Interactive Cruising Guidebook is a great online resource with information about marinas, anchorages, and much more - which is also built into many navigational software products and apps. Nicola Rodriguez's Sail Away: How to Escape the Rat Race and Live the Dream is a useful starting point for those new to cruising. Take along the great birding book Petrels, Albatrosses & Storm-Petrels of North America next time you're voyaging offshore to identify and learn more about the sea birds you see. Sailing Fascination by Heinrich Hecht has hundreds of beautiful photos of sailboats and the people on them, but it's much more than just pretty pictures. Nautical Antiques is a beautiful book of photos of scrimshaw, antique navigation instruments, and much more – perfect for those with a love of maritime history. Good Old Boat Magazine is chock-full of articles covering almost everything you need to keep your sailboat running or make upgrades you can do yourself. Small Craft Advisor magazine maintains a steadfast approach to boating of the smaller scale practiced by so many enthusiasts and do-it-yourselfers. Blue Water Sailing is primarily intended for sailors with advanced skills and ambitions for long-distance cruising and provides in-depth information for those preparing for serious voyages. The One Pan Galley Gourmet by Don Jacobson and John Roberts has 170 varied, easy-to-cook recipes suitable for both herbivore and carnivore, with choices for both those with spicy tastes and those who may need blander food after a day of rollicking waves.